Alex Smith's season is almost certainly over. 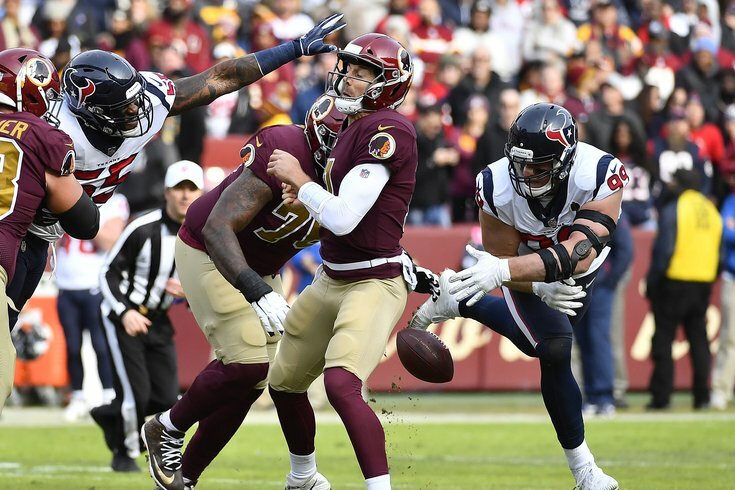 Washington Redskins quarterback Alex Smith suffered a gruesome leg injury on Sunday against the Houston Texans, and it would be a shock if his season isn't over. I won't show the injury here, because frankly, I don't want to see it again. If you are interested, it'll be extremely easy to find on Twitter. Heading into Sunday's games, Smith had led the Redskins to a 6-3 record, throwing for 10 TDs and 3 INTs, with a quarterback rating of 90.7. The Redskins' backup quarterback is Colt McCoy, an eight year veteran with a career starting record of 7-18. They don't carry a third quarterback. The Redskins lead the NFC East, with the Philadelphia Eagles and Dallas Cowboys trailing them (for now) by two games. With Smith out, the Redskins' chances of holding on as division champs take a big hit. The Eagles play the Redskins Week 13 in Philly, and then Week 17 in Maryland.